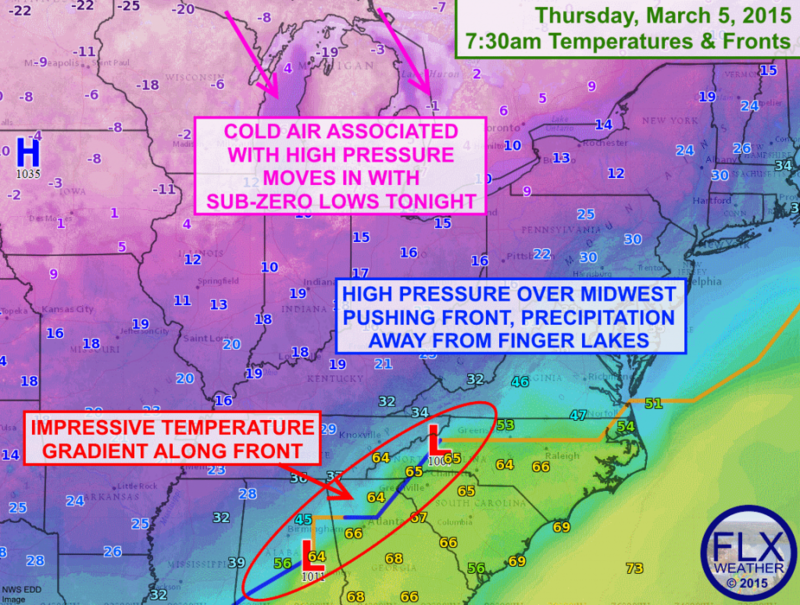 High pressure over the Midwest will shift east, resulting in clearing skies and subzero temperatures Thursday night. Clouds remain thick across the Finger Lakes Thursday morning as strong frontal system to our south brings wintry weather from New England into the Deep South. A strong area of high pressure, meanwhile, has built in across the Midwest with clear skies and cold temperatures. This high will continue to exert its force eastward, keeping the front and its precipitation moving away from the Finger Lakes. Cold, dry air will continue moving into our region on northwest winds ahead of the high pressure system. Temperatures, which are starting the day in the low teens, will only rise a few degrees this afternoon. Clouds may start to break up a bit late this afternoon, but should move out overnight. The clear skies and calm winds that will result will allow temperatures to drop below zero once again tonight. Some of the normally colder spots in the region could drop lower than -5º. Friday will be sunny, though some clouds will start to work in late in the day. Temperatures should climb to at least 20º Friday afternoon. The weekend is looking alright, with milder temperatures in the 30s and just a coating of snow Saturday afternoon and an inch or two Sunday night. I now have over 2,500 votes in the FedEx Small Business Grant Contest- thank you for your overwhelming support! Please continue to vote and help me reach 3,000 votes before the weekend! Vote here!